I just took this personality test and it was scary accurate; it matches you up with different personality subtypes and gives you a shitload of information about yourself. You guys should take it too, and share what personality subtype you get so we can all learn about each other more! 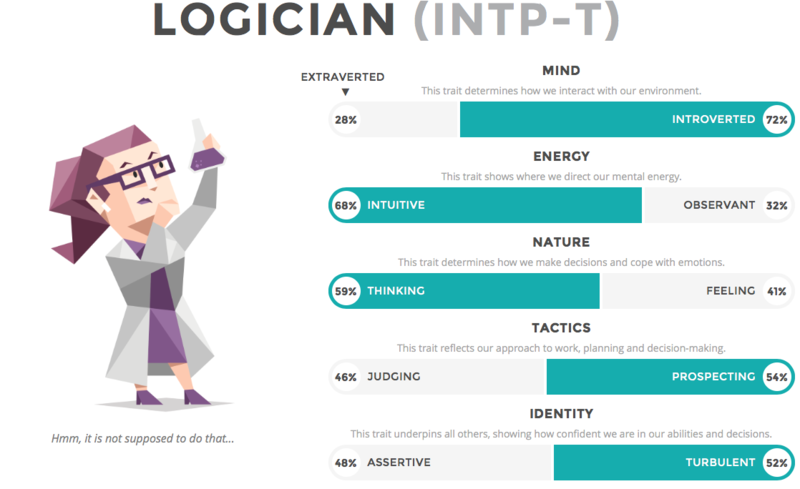 I got: INTJ, the Architect. "If anyone is to be found spontaneously breaking into song and dance, it is the ESFP personality type. ESFPs get caught up in the excitement of the moment, and want everyone else to feel that way, too. 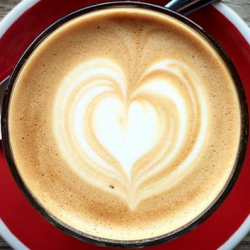 No other personality type is as generous with their time and energy as ESFPs when it comes to encouraging others, and no other personality type does it with such irresistible style." 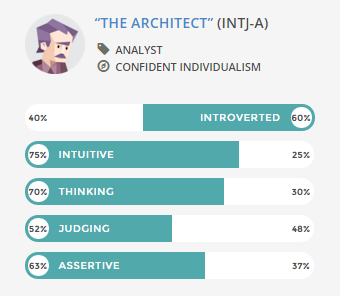 [quote="Sammiches822;1311"]I got: INTJ, the Architect. I got Mediator (INFP-T) lol. "INFP personalities are true idealists, always looking for the hint of good in even the worst of people and events, searching for ways to make things better. While they may be perceived as calm, reserved, or even shy, INFPs have an inner flame and passion that can truly shine. Comprising just 4% of the population, the risk of feeling misunderstood is unfortunately high for the INFP personality type – but when they find like-minded people to spend their time with, the harmony they feel will be a fountain of joy and inspiration." 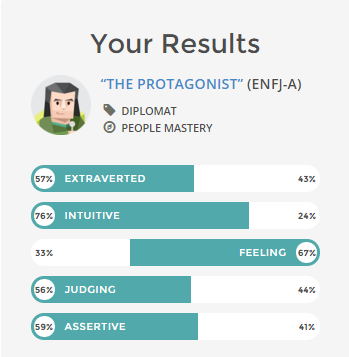 I got ENFJ- The Protagonist! I got INFP ("The Mediator"). I can't say I agree with everything it told me, but quite a lot. I imagine I'm very much a borderline case in some aspects like logic/emotions. I'm the only logical person here - I fear for the server. Last time I did the Meyers-Brigg it was different... I'm pretty middle-of-the-road on a lot of things so I'm guessing I can go either way pretty easily. Well... nobody's got the same as me yet! @zyno69 lol @ all caps "THE COMMANDER"